MB-100 Safe Deployment - NexSens Technology Inc.
Water quality data is typically referenced by distance from the water’s surface. In such applications bottom mooring chain permits flucutations in water level, which effectively allows the buoy to drift along the water’s surface in the vicinity of the mooring system. To deploy a surface buoy, simply boat to the desired monitoring location and place the MB-100 buoy with data logger in the water. Allow the buoy to right itself, paying out the sensor mooring and anchor line as necessary. Make sure the anchor is still on board the boat. Sub-surface deployments are used for bottom referencing water quality data. Data is bottom-referenced when it is collected by sensors that are fixed along a mooring line in a water column that is not free to move vertically. As a result, water quality data is always collected at a fixed distance from the water body’s floor. Sub-surface deployments are completed in the same way as surface water deployments. However, prior to a sub-surface deployment, it is highly recommended that the MB-100 foam hood be removed. This will lighten the buoyancy of the buoy, providing a setup that is more stable with less anchor weight. Sub-surface MB-100 deployments are most effective when used along with a larger surface buoy. 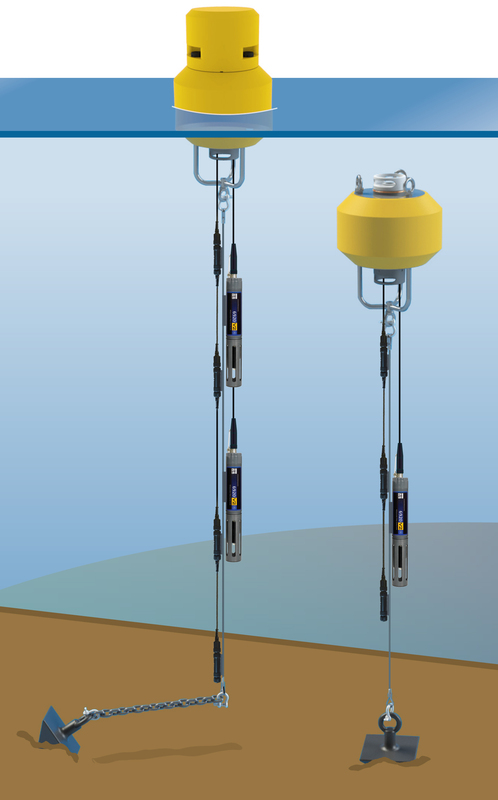 In these configurations, the submersed SDL500 data logger acts as a “satellite buoy” and transmits the sensor data it collects to another SDL data logger on the surface via direct cabling. The surface data logger is typically outfitted with a remote telemetry option for automatic data upload capability. Alternatively, MB-100 data buoys can be deployed as standalone, sub-surface systems. For those applications, however, the entire system including the mooring and anchor must be pulled each time batteries need changed or sensors require maintenance or calibration. MB-100 pictured in a surface buoy deployment (left) and a standalone sub-surface deployment (right).